Seoul cafes: 2013 Korean holiday: 5 day weekend for Chuseok! The weekend is here and the holiday season is finally beginning to make me sing~ on top of that, there is one more great thing that's making me go, "YES YES YES 2013 is going to be a great year!" Korea will have a 5 day weekend for the very big Chuseok holiday("Korean Thanksgiving") next year! It falls on the 18, 19, 20th of the month of September (2013). I don't remember the last time Chuseok was ever this long - it's been long over due. Korea deserves to unwind for 5 full days. No excuses Korea! So that means, "vacation" / "get away" planning for us (and the rest of Korea for the matter..)! We are already excited about the possibility of a "big trip". Where will we go?! Ahh, we don't know :) But I'm already excited about 2013! 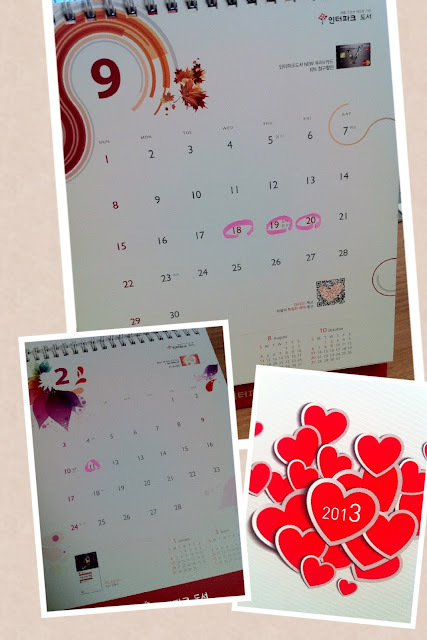 ***Korean(Chinese) New Year called Suhl-nal only gives 1 day off(a Monday) for the month of February. The holiday falls on the 9th, 10th and 11th. Unfortunately many companies will only allow one day off for this holiday.